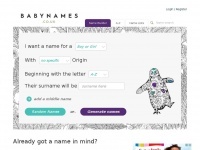 Helps you pick a baby name by letter, A to Z list, Biblical Names, Uncommon names, Popular names. Create your own shortlist now. 4. Add to shortlist /flag/flag/shortlist/1091?destina­tion=node&token=64194..